We'll kick things off with the Whirlpool WDT750SAHZ at a price point of $799 in stainless steel, $699 in black or white, and $899 in black stainless steel. The full stainless steel tub offers exceptional performance and energy efficiency, while the nylon rack system is durable enough to handle everyday dishes, pots and pans, along with glassware and china. The top rack is height-adjustable for washing tall, bulky items in the top rack, and the silverware basket can be placed in the lower rack or in the door to make room for more dishes and maximize rack space. The Total Coverage Spray Arm cleans with twice the jets for more coverage from all angles. An Extended Dry option and Heated Dry option help get your dishes thoroughly dry after a wash. Other great cycles and options include a One Hour Wash and an NSF-Certified Sanitize option. At 47 db operation, this model is quieter than most (read more about dishwasher decibels here). This model has integrated controls for a sleek look that blends in with your kitchen. 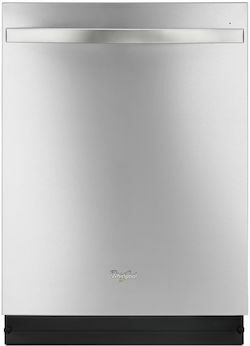 Overall, this is a solid dishwasher with a good array of options and features for the money! Click here to read over 270 real customer reviews of this product! The next model in our search for the best dishwasher for the money is manufactured by GE. The GE GDT655SSJSS, at a price point of $919, is loaded with exceptional features that will improve wash performance. It has GE's most advanced wash system, increasing wash power by 65% over older GE dishwashers. The height-adjustable upper rack is equipped with two stemware safe shelves and it glides in and out easily. Shift it up to 2'' to accommodate tall plates or bulky items. Plus, the upper rack has four dedicated jets for thoroughly cleaning tall items like water bottles. It has a 46 decibel (dBA) rating and a light on the outside of the door lets you know that it is running - it's that quiet! It has four wash cycles, including Heavy, Normal and Light, and 10 wash options, including upper or lower rack only for small loads. The Bottle Jets in the upper rack are an awesome feature for cleaning inside of tall items like vases and water bottles. The controls are at the top of the door and are easy to use. It has a stainless steel interior, like the Whirlpool model. These and many other features allow you to perform an excellent wash on your dishes and make this dishwasher an excellent choice for your home. It comes in a wide array of colors: in addition to stainless steel or GE slate at $919, it's also available in black or white at $819 or in black slate or black stainless steel at $1,019. Compare slate, black slate, and black stainless steel in our article! Click here to read over 450 real customer reviews of this product! Cycles & Options: Both models have automatic sensor washes, but the Whirlpool offers a 1-hour quick wash while the GE model does not. However, GE wins in terms of total options, like Steam PreWash and wash zones. It may have an edge when it comes to handling dry, caked-on food. Other Features: Both models are quiet, come with height-adjustable upper racks, and offer heated dry options. GE stands out with the Bottle Jets: if you constantly wash sports water bottles that you want to really and truly clean, this feature could be a must-have for you. Look & Feel: Both offer similar styling and come in stainless steel, black, white, and black stainless steel. The hidden controls offer a seamless look for your kitchen. If you're interested in GE's slate or black slate colors, check them out in person if you can! 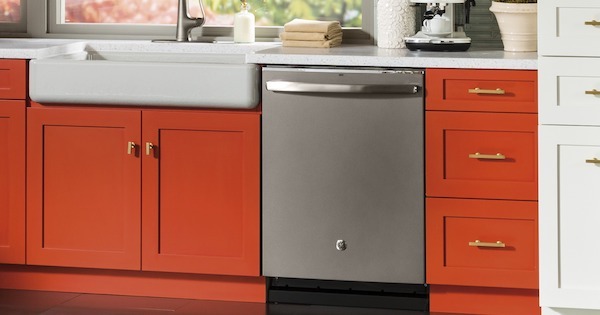 Both of these dishwashers are excellent, well-featured appliances for your home. Choose the one that offers the best features that will benefit you the most. The Bottle Jets on the GE dishwasher are a great feature for people who hate having to re-wash bottles because the dishwasher left some crud behind. If you want a stainless steel interior and adjustable upper rack for a lower price, the Whirlpool option might be for you! We hope you enjoyed this comparison and it helped you to choose the best dishwasher for the money for your next purchase. Please leave us a comment below. We'd love to hear from you! Editor's Note: This blog was originally published in November of 2014 and has been completely revamped and updated for accuracy as of the publication date noted above.